To register as an exhibitor, you can be well presented during the exhibition. Complimentary delegate passes will be offered for booth reservation. For more information about exhibition, please visit Trade Show page. To register as a delegate, you can get access to all the conference sessions, panel discussions, workshops and conference documentations to learn about latest trends in global gold mining sector from industry leaders. For more information about conference and program, please visit Conference page. To register as a sponsor, you can not only get the high exposure and visibility but also enjoy the priority in speaking slot, booth arrangement, advertising and onsite reception during the event. Additionally, we can offer pre-event advertising for reserved sponsors before the event. To learn more about sponsorship opportunities, please visit Sponsorship page. 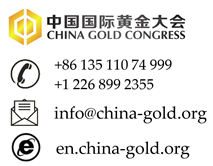 High-level industry leaders are invited to speak at China Gold Congress. If you don’t want to miss the speaking slot, please submit your speaking abstract and a short biography to us. Speaker Registration Form will be sent to you as soon as we confirm your speaking slot. To learn more about our topics, please visit Program page.